Neville takes guard. My favourite picture of the man. I can’t remember when I first met J Neville Turner but it must have been at an Australian Society for Sports History (ASSH) Sporting Traditions Conference or a meeting of the Melbourne group of members, probably the former. 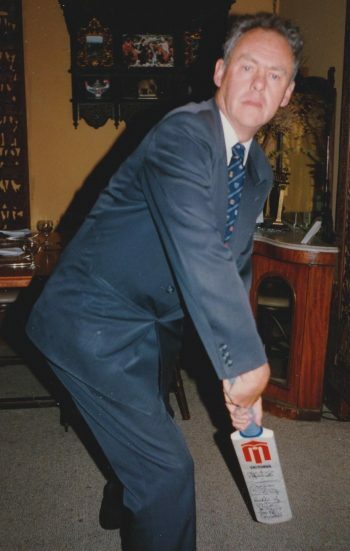 He presented as an English gentleman of the old school, precise of manner, deeply learned but carrying it lightly, with a catholic range of knowledge of arcane subjects and a bottomless interest in cricket and football. He was always part of the ‘traditional’, in the invented sense, football matches which were played in a gap in the biennial meetings. Like Bill Murray, I always enjoyed Neville’s preaching of non-violence followed by the sedulous attempt to kick people off the park when the soccer match took place—not with malice but with extreme uncoordinated enthusiasm. 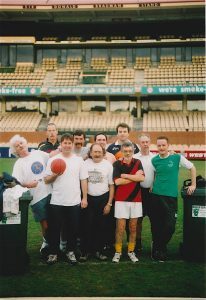 ASSH football match on Adelaide Oval, July 2001. Featuring Bill Murray, Gordon Fry, Barry Nicholls, Nick Guoth, David Nadel, Andrew Howe, Roy Hay and J Neville Turner. We both attended the World Cup in the USA in 1994 though our paths did not cross. I got to 19 games and I think only the organiser, Alan Rothenberg got to more (21), and he had a helicopter. I was able to give Neville most of the photographs he used for the American leg of his World Cup diary which he published to great acclaim. I have virtually all my side of my correspondence with Neville over the years, thanks to the retention of the electronic copies, but while I am pretty sure I have many of his replies and other letters to me, they are buried in boxes of material in a lock-up in Bannockburn or in unsorted and unfiled folders in the Hay-Desira collection at the MCC Library. If anyone is going to write a biography of Neville, I’ll make an effort to dig them out if requested to do so. What I do have is one of his careful pieces of forensic analysis of the legal issues that had arisen when one of the founders of ASSH threatened to sue the association and one of its members over comments in an article that been published in the Bulletin. It was clear and beautifully constructed and full of sound sense. He was also of enormous personal support more generally during the time when I was president of the society and there were issues to be resolved. I hope I was able to return the support when he was president in 2003–05. There was a tie in the voting and so he and Richard Cashman shared the role, a year about. Neville’s talks to the Melbourne chapter or to ASSH Conferences were often the absolute highlights of these occasions. 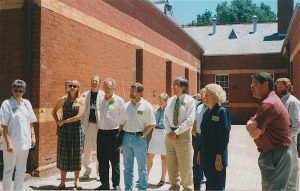 ‘The Case of the Half-Eaten Pear’ has been mentioned by others as his piece of resistance when it was delivered at the Canberra Conference in 2007. His performance, carefully choreographed by Bernard Whimpress, who subsequently published a written version, had the audience in stitches at a time when it was in danger of falling into post-modernism at the urging of some younger members. It was before another ASSH Conference when I was asked to ‘referee’ Neville’s proposed talk when there had been some debate over its acceptability. It had obviously been confusing members of the program committee, who were concerned about its scholarship. I told the inquisitors that there could be no doubt about its academic integrity and by that stage in the conference everyone would be looking for some light relief which Neville would undoubtedly provide. He did. 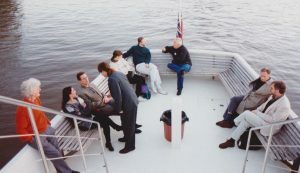 On the river at ASSH Sporting Traditions X in Brisbane, 1995. Bill Murray in red at left. Neville and Peter Mewett sitting at right. 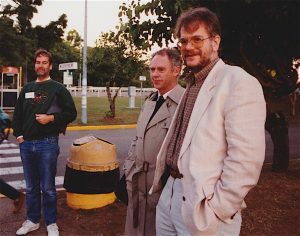 Bernard Whimpress, Neville and Peter Mewett in Brisbane, 1995. Frances and I coincided with John Harms at one of Neville’s jazz weekends at Warburton. He had got a group of friends and local musos together and it was one of those informal occasions when you could relax and enjoy the whole setting—hotel, food, music, conversation and the odd glass of red! Evenings at ASSH conferences would find Neville on the piano till all hours. ASSH members at a strategic planning meeting, Sunbury campus of Victoria University. Featuring: Imke Fischer, Rob Hess, Neville, John Dean, June Senyard, Brian Moroney and Phil Mosely. Two days ago I sent off to be published print-on-demand a Selected Essays of Neville’s including a couple of Sporting Tradition pieces, Half-Eaten Pear plus other writing on soccer, cricket, law, literature and music plus an incomplete bibliography. It runs to 200 pages. I was in touch with Bruce Coe about this yesterday so hopefully I will receive a copy at the end of the week and will be able to advertise more widely in the ASSH Bulletin. I’ve also been thinking about a collection of tributes down the track. That is brilliant, Bernard. Put me down for a copy. Feel free to use the above if you do go ahead with the collection of tributes and let me know if there is anything else you want.